In my articles I chronicle my own process of self-education in becoming a successful beekeeper—which has been much more difficult since the invasion of varroa. The learning curve has been brutal—there were times when I thought that I was the worst beekeeper in the world (although that notion was quickly dispelled by visiting others). For a change, I’m going to direct this article toward beginning beekeepers, who are often overwhelmed by conflicting advice about the “proper” way to keep bees. This spring, as usual, I’ve given quite a number of beekeeping workshops to beginning and “recreational” (formerly “hobby”) beekeepers. These beekeepers are wallowing in information gleaned from the Internet about the “right” way to keep bees. Unfortunately, they do not yet have enough experience to know what to believe, whereas long-time beekeepers simply roll their eyes at some of the suggestions being promoted. There is an old adage that if you want to get a definitive answer to any beekeeping question, just ask a second- or third-year beekeeper, as they are generally at the peak of their confidence level regarding their knowledge about beekeeping (and often blog away offering advice to others). After that, most of us are humbled by the fact that beekeeping is a lifelong learning experience, full of surprises, and ruled largely by Murphy’s Law. The best way to learn beekeeping is to work with an experienced mentor who has successfully kept bees in your area for many years. I’d look for someone who is candid about the mistakes they’ve made, and the number of times that they’ve recovered from major crashes. Such beekeepers are generally not the noisiest self promoters, but here’s a tip: any beekeeper worth his salt will have bees for sale every spring. The biggest problem with healthy overwintered colonies is how to keep them all from swarming off, and it is relatively easy for any good beekeeper to triple his number of hives each spring if he wishes. In many areas that I’ve visited, there exists a well-intentioned and vocal “Beekeeper Taliban” that is adamant that newbies must practice some specific sort of bee management (such as the style of hive, type of comb, strain of bee, or sort of mite management, or lack thereof). In some areas the local Taliban exhorts newbies to rigidly adhere to some form of “Faith-Based Beekeeping” in which their sacred duty is to follow some specific practices, or to trust in Nature to be benevolent. The reality is that Nature and varroa aren’t nice to bees. I recently spoke to the beekeeping club in a California region known to be a beekeeping paradise, but whose local Taliban promotes “treatment free” beekeeping. In a survey of their membership last year, some six out of ten colonies perished! It makes no sense to me to set up bright-eyed new beekeepers for the feelings of failure, disappointment, and guilt that come when their darling little bees die a miserable death. Indeed, a quarter of those in the survey did not plan to try their hand at beekeeping again. To me, this sort of dismal outcome is unnecessary and inexcusable. A colony that has succumbed to a varroa/DWV collapse. Note the adult bees head up dead in the cells, the white guanine deposits on the cell ceilings, and the bee with deformed wings. This is the most common way for untreated colonies to die. It’s not a pretty death, and is totally preventable! I meet hundreds of newbies each year, and really enjoy their enthusiasm and joy in their newfound hobby. My wish is for them to be successful at their novel adventure. The point that I try to make is that it is not up to beginners to save the world by trying to keep bees without treatments. Everyone wants to be a “treatment free” beekeeper—but you are not really “keeping” bees if they die each year! Beekeeping is enough of a challenge to learn without making it more difficult by allowing varroa to run rampant. What I suggest is to first learn to practice good bee husbandry, such as you would if you were starting with any other pet or livestock. Learn to keep your bees alive and well for a few years; then you can raise the bar. You wouldn’t allow your dog or cat to suffer from a gruesome mite infestation, so why would you allow your bees to die a similar awful death? My advice to newbies is to relax, and have fun keeping bees—it’s one of the most amazing and enjoyable things that you’ll ever do, and a great way to get in touch with nature. Keep in mind that beekeeping is simply another form of animal husbandry. It’s your responsibility to take care of your charges, and the reality is that sometimes they may require your help in dealing with a lack of forage or the relentless depredation by the varroa mite. It is rewarding to assist them through difficult times. Well, by this point I’m sure I’ve affronted quite a few beekeepers, but since I am an equal opportunity offender, please allow me to continue to get into more hot water! Nature does not play favorites, and bees must compete in the “all’s fair” evolutionary game. Many plants produce toxic nectars and pollens (note that the honey bee did not evolve in North America, and may not recognize our poisonous plants). For example, in my area there are two extremely toxic plants that can wipe out entire apiaries under the right (or should I say, wrong) conditions. Similarly, some plant pollens may be nutritionally inadequate for honey bees, and some honeys are unsuitable for wintering upon. Contrary to what one might think, there are instances where bees actually survive better when fed pollen substitute or refined sugar syrup, than they do on unsuitable natural forage! The local population of bees is limited by the lack of suitable cavities and by the frequent inability to store enough honey to make it through the winter. In addition, viruses and other parasites (notably varroa) often take down stressed colonies. Even under the best of conditions, nature is brutal to bees. Let’s imagine a natural paradise with a stable population of colonies, free from human influence. In an ideal spring, every colony will produce at least one swarm, which means that the population of colonies will temporarily more than double. But since the population is stable, only the original number will survive through the next spring. The simple math is that under the best of conditions, in a stable population, half the colonies will perish each year. My point—don’t beat yourself up if you lose some colonies. Starvation, as indicated by all the tails pointing out of the cells, was the number one cause of colony losses by surveyed hobby and sideline beekeepers last winter (van Engelsdorp 2011). Starvation is easily preventable by good husbandry and a sack of sugar. Bees have the ability to detoxify these chemicals, and also many of the other natural toxins in pollen and nectar (almond pollen, for example, is chock full of toxic amygdalin). Our concern with “chemicals” should be directed toward the additional “xenochemicals” to which they are exposed—the man-made pesticides and pollutants, and especially synthetic beekeeper-applied miticides. My point? There is nothing unnatural about using essential oils or organic acids as treatments against the varroa mite or other disease organisms. Putting such natural treatments in our hives is akin to the way that people have long used herbs and spices to repel and kill parasites, and to preserve food. Contrary to the exhortations of some Beekeeper Talibans, it doesn’t seem to matter much to the bees as to what kind of box you provide for them or sort of comb that you keep them on. A few years ago, I saw a large egg-shaped hive made out of manure-plastered straw, containing curved plywood frames, being touted as the “most natural” way to keep bees—please, give me a break! As far as I can tell, the type of equipment that you use is of no more concern to the bees than is the color that you paint your boxes. The style of equipment is more a reflection upon the beekeeper’s aesthetics than a factor in success at beekeeping. I get along just fine with local beekeepers with top bar hives or Warre hives; screened or solid bottom boards; migratory covers or copper English garden pitched roofs; pine, cedar or Styrofoam boxes; deep, medium or jumbo frames; small cell, large cell, or foundationless; “organic” folk or those using synthetic miticides. To each their own! Each of these groups at times has healthy hives, and each experiences collapses. When nature is benevolent with abundant bloom, any damn fool can successfully keep bees; when times get tough, better beekeepers sell bees to those who are whining. I choose to pay attention to the quiet beekeepers who sell bees and make honey year after year! I attribute success more to good stock and proper husbandry, rather than to any particular equipment, treatment, or philosophy. Hang with me, and I will give you all the “rules” for successful beekeeping. My point—standard Langstroth hives are “standard” since they have proven the test of time for over 150 years. Believe me, if anything better had been invented, commercial beekeepers would have adopted it in a heartbeat! Use whatever you want—top bar hives (a current fad) with a window are a kick for the beginner who just wants to observe comb building closely. However, if your interest is ease in beekeeping, and maximum honey crop, then I’d start with standard equipment, using 10- or 8-frame deeps for the brood chambers. I’m surprised by those who tout “natural beekeeping” as being something new and revolutionary! Folks, we were all “natural” beekeepers before varroa arrived (and my Australian friends are all “natural” beekeepers still). 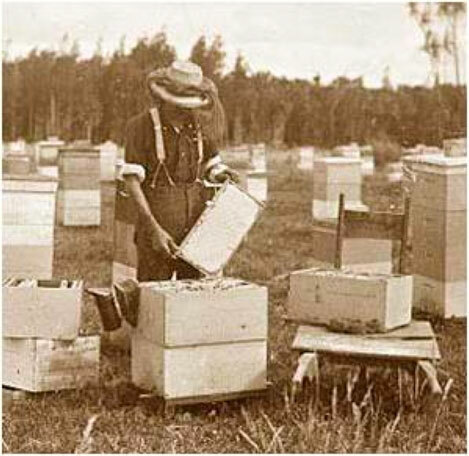 We all kept bees on “organic” natural beeswax foundation, in “natural” pine boxes, and most of us on “natural” forage. In fact, a number of cheapskate beekeepers cut costs by making the bees draw foundationless combs. The only argument in those days was whether or not to prophylactically treat with antibiotics for AFB. I personally choose to eschew synthetic miticides, antibiotics, and syrup feeding in general in my own operation, but I don’t feel that gives me the right to criticize others. The migratory beekeepers who move bees from crop to crop are doing nothing more unnatural than herding their livestock to better pasture, or than the “natural” migrations of Apis dorsata or Apis mellifera scutellata (the Giant and Savannah honey bees). Clearly, moving bees on semitrailers to pesticide-laden crops is not “natural,” but neither is buying factory-farmed cheap food at the supermarket. The commercial migratory pollinators should be thought of as hard-working heroes, and a critical player in agricultural production. Bees “naturally” live in irregular tree cavities far off the ground, not in rectangular boxes located at knee level. And as soon as you set up an apiary of a few dozen hives, you have created an unnaturally crowded situation—and are now engaged in a concentrated livestock operation. Plus, there is nothing “natural” about taking their honey, feeding them syrup, or opening a hive and disturbing them. Whew! Glad that I got that off my chest! (No offense to Ross Conrad or the “organic” beekeepers, as I strongly support their efforts to return to beekeeping without synthetic miticides). This beekeeper didn’t even realize that he was being a “natural beekeeper”! Back in the day, we were all “natural” beekeepers. Some may make the argument that by treating your bees that you are working against nature by propping up weak stock that should be allowed to die. The reality is that it serves no purpose whatsoever to allow colonies to unnecessarily die from varroa, and if you do so, you actually do a disservice to surrounding beekeepers, as their colonies will quickly pick up the mites from your collapsing hives. The ensuing domino effect can wipe out all the hives in a neighborhood! The “be tough or die” approach (Bond Method) of bee breeding certainly works, but is crude, and often selects for bees that have undesirable characteristics—such as small colony size, excessive swarming, and irritability. The point to keep in mind is that selective breeding takes place at the genetic (and epigenetic) level, rather than at the worker bee level. Genetics are carried by the queens–there is absolutely no reason to allow the death of all those innocent workers in a potentially productive colony just to make your point. The only bees that need to die are the queen and drones; both are easy to intentionally kill at the appropriate time (during swarming season). Requeen with resistant stock, best obtained locally. The ultimate evolutionary result is exactly the same as if you had allowed mite-infested colonies to die, but you get honey in return rather than a bunch of deadouts. To me, good husbandry is all about keeping your colonies alive and healthy! I find it of great benefit to intentionally question my own thinking and assumptions, so as to avoid falling into comfortable complacency of thought and habit. If I have provoked you by challenging the common misconceptions above, then perhaps you may become a better beekeeper for it! Beekeepers historically enjoy pettifogging over details of management, but such minutiae are of little import to beginners, who just want to learn how to keep a couple of hives of bees alive. To that end, I’ve come up with a set of four general rules for beekeeping that address what I’ve previously called “The Four Horsemen of Bee Apocalypse”—famine, chill, pestilence, and poisons. Let’s go over them one at a time. Bees thrive on good forage, and get sick or die when forage is poor. I have covered this subject in great detail in my “Fat Bees” and other articles. The take home message is that colony health is nearly completely dependent upon good nutrition, with pollen being the most important source of critical nutrients (notably protein). 1. A bee’s immune response to pathogens, notably viruses, is dependent upon that bee receiving adequate protein. A stunning piece of information came from a recent study from the Tucson Bee Lab (DeGrandi-Hoffman 2010). The researchers measured the levels of Deformed Wing Virus in newly-emerged adult bees, and then kept them in cages, placing them under one of three protein feeding regimes—no protein, pollen substitute, or natural pollen. The results were eye-opening! DWV levels skyrocketed nearly 700x in the bees that did not receive protein, rose and then fell in those fed pollen supplement, and completely disappeared in the bees fed pollen. These results hammer home the point as to how important it is for newly-emerged bees to have access to nutritious pollen. 2. During the spring and summer, the average lifespan for adult workers not parasitized by varroa or nosema is about 36 days (Harris 2010)—it is even shorter if they are parasitized. That means that the entire adult bee population in a hive “turns over” once every five weeks! That’s about 2 lbs of bees that need to be reared every week, which means that a thriving colony requires about 2 lbs of pollen weekly simply to maintain its population (the pollen to bee conversion ratio is roughly 1:1 (Rashad 1958)). 3. In order to successfully winter in cold areas, the colony must have ample pollen in late summer and fall to produce a population of protein-rich “winter bees,” and store enough pollen for midwinter broodrearing. Practical Rule #1: Good bee husbandry means that you either keep bees where there lots of flowers in bloom, or feed sugar syrup and/or pollen supplement when appropriate. Honey bees evolved in the tropics, and can only survive in temperate regions if they have a warm, dry cavity in which to cluster and raise brood. Chilling stresses bees and shortens their lifespan and resistance to disease (see Old Bees, Cold Bees, and Sick Bees 2). Bees use honey as the fuel source to generate the heat necessary to warm the bedroom—it is critical that they always have a “heating fuel reserve” in the form of combs of stored honey within the periphery of the cluster. Colonies benefit by being kept in full sun (unless the temperature exceeds broodnest temperature). Hives in full sun have fewer problems with varroa, tracheal mite, nosema, chalkbrood, and small hive beetle, and winter better. I also find that colonies in full sun are much more amendable to being worked, and sting far less than those in the shade (an important point for beginners). Ideally, face the hive entrance toward the morning sun, and provide a winter entrance near the cluster so that they can quickly take advantage of flight opportunities. The type, size, shape, or color of the cavity makes little difference so long as it is dry and not drafty. The cluster naturally works up and down vertically to take advantage of heat convection, so bees in stacked hive bodies will likely produce more honey and winter better than those in horizontal hives. Practical Rule #2: Keep bees in tight boxes with good sun exposure. Make sure that there are always combs of honey available as fuel for keeping the cluster warm. My Sick Bees series has detailed how honey bees are in evolutionary flux as they evolve to deal with a host of recently introduced parasites, notably the varroa mite and its associated viruses. Great progress has been made in the development of parasite-resistant stocks, notably the Russian and VSH strains developed by the ARS Baton Rouge Bee Lab—both of these strains are maintained without any treatments against parasites. There are also a number of beekeepers who are successfully breeding regionally-adapted parasite-resistant stocks (I will be writing about this in the near future). Mark and Melanie of Zia Queen Bees at their scenic high-elevation New Mexico home yard. In this area, no one treats for varroa, yet mite levels generally remain very low (I checked). However, survivor stock that does well in one area may succumb to mites when introduced elsewhere. I don’t know why! Many small-scale beekeepers in areas of low mite pressure are able to keep naturally resistant bees without treatments, with acceptable rates of survival. It’s more difficult to do so as you scale up, but there are now a number of “natural” treatments that are quite effective at keeping varroa in check (see Miticides 2011). What I recommend is to monitor varroa levels regularly, and to help your bees if they can’t keep the mite in check by themselves. By simply keeping varroa levels low, you’ve already won over half the battle for maintaining healthy hives. In my next article, I will demonstrate effective methods for monitoring for varroa and nosema. Note that varroa levels are unpredictable. For instance, this spring in the California foothills we had over a month of unseasonably warm weather in January. Flowers started blooming early, and colonies brooded up prematurely in response. As a result of that and a humid spring, mite levels are much higher this season than “normal.” I usually don’t need to apply any mite treatment until July 1st, but this year monitoring is calling for me to give one in May. Only by regular monitoring will you be able to keep varroa from blindsiding you and your bees. Practical Rule #3: Use mite-resistant bee stock. Monitor mite levels! Use “natural treatments” if necessary. I’ve already mentioned that toxic pollens and nectars should be avoided or diluted, but those are relatively predictable. Much more of a problem are the man-made synthetic pesticides, plus the more generic pollutants that bees pick up in dust and water. Agricultural (and landscape) pesticides have always been the bugaboo of beekeepers. Nearly 100 million pounds each of insecticides and fungicides are applied in the U.S. each year—many of which are toxic to bees. Commercial beekeepers have long recognized the effects of being “sprayed”—piles of twitching dead bees in front of depopulated hives. But nowadays, the effects are often more insidious. There a three other new problems since the arrival of varroa: beekeeper-applied miticides, pesticide synergies, and systemic pesticides. It used to be that pesticide spraying mainly affected the foragers, and the colony could often recover from such a loss, as not much of the pesticide would actually make its way into the broodnest. All that changed when beekeepers started intentionally applying synthetic miticides directly into the hives. Most of these miticides readily dissolve into the beeswax combs, and then migrate back out into the brood and bees over the long term. Even worse, the different miticides can synergize with each other, and with other pesticides to create even greater toxicity (Johnson 2009). 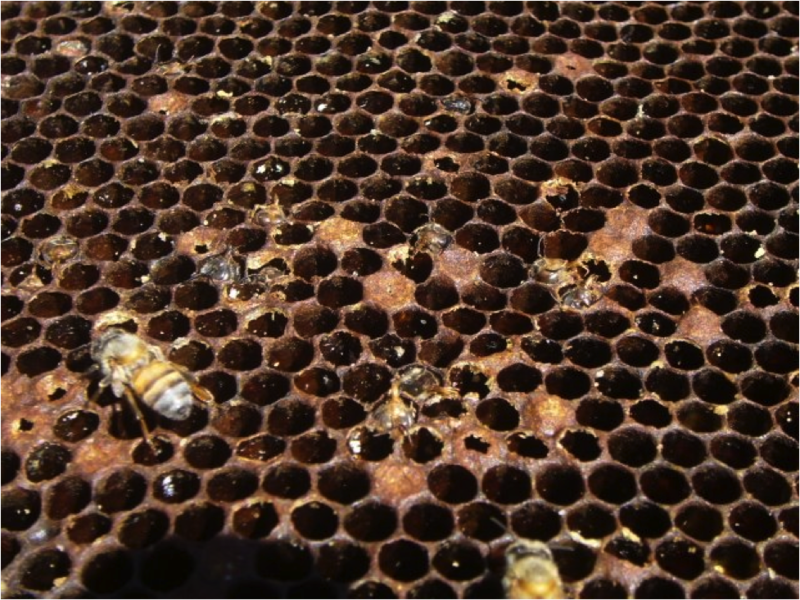 The effects of pesticides upon colonies moved into a new arena when beekeepers elevated the background level of toxins in the combs by the repeated application of synthetic miticides. In addition, both Judy and others have unpublished data that suggest that pesticide residues may make bees more susceptible to nosema, viruses, and varroa. The above findings may help to explain why colonies run in commercial pollination are so hard to keep alive! I’ve spoken to a number of such beekeepers who simply watch their colonies go downhill after being exposed to the plethora of pesticides used in agriculture. And the problem is that the residues remain in the combs, affecting the next generations of bees when they restock their deadouts. Queen failures are commonplace these days. Insecticides, miticides, and fungicides are clearly a major issue in commercial beekeeping, and likely a contributory factor to bee health issues in agricultural, urban, or suburban areas. Avoid them as much as possible! 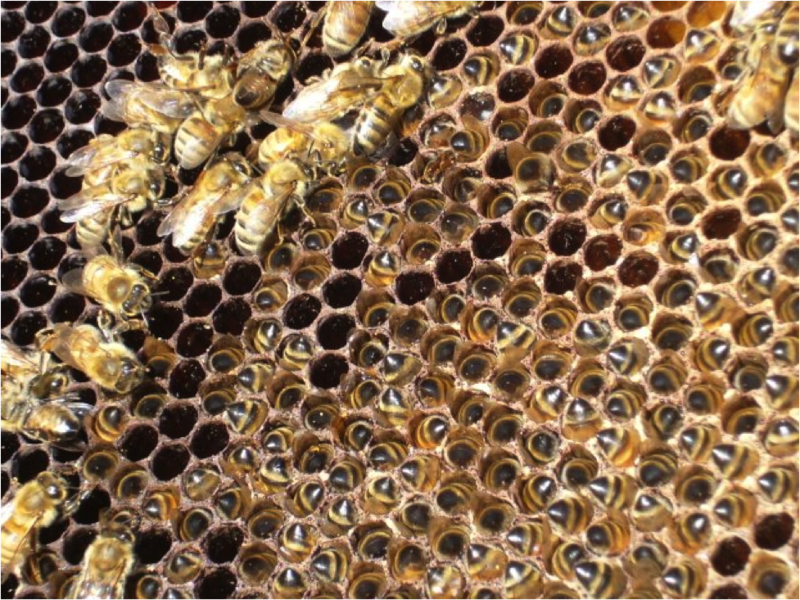 The “natural” miticides, although stressful to the bees during application, appear to be well tolerated in the long term, and do not leave harmful residues in the combs. Just in case I haven’t offended every Beekeeper Taliban by this point, I’m very much aware that a “fatwa” has been issued by some to ban the neonicotinoid insecticides. However, there is very little scientific or even good anecdotal evidence to back up their claims that proper application of seed treatments are causing major problems. I will be writing about pesticides in great detail in Sick Bees 10. Practical Rule #4: Do not use synthetic miticides, and avoid pesticide exposure. Rotate out old combs. Keep bees where there are lots of flowers all season, or provide supplemental feeding. Provide a warm, dry, sunny hive. Avoid synthetic miticides and pesticides. It’s really not much more complicated than that! Any advice that you get other than the above is largely superfluous and more a matter of style rather than substance. Go ahead and enjoy keeping bees however you want, and don’t worry about what others think! Students from my beginners classes go on to keep bees in every sort of equipment. I caught newbies Kent and Catherine Heaton gingerly and excitedly inspecting the first combs in their top bar hive—an amazing process for someone who is seeing it for the first time! I have finally found someone to help me manage my website, and have uploaded all my past articles. You may find that it’s easier to refer to them there than to dig through your old issues of ABJ. DeGrandi-Hoffman, G, Y Chen, E Huang , and MH Huang (2010) The effect of diet on protein concentration, hypopharyngeal gland development and virus load in worker honey bees (Apis mellifera L.). J. Insect Physiology 56: 1184–1191. Harris, LJ (2010) The effect of requeening in late July on honey bee colony development on the Northern Great Plains of North America after removal from an indoor winter storage facility. Journal of Apicultural Research and Bee World 49(2): 159-169. Johnson, RS, HS Pollock, and MR Berenbaum (2009) Synergistic interactions between in-hive miticides in Apis mellifera. J. Econ. Entomol. 102(2): 474-479. Rashad, S and RL Parker (1958) Pollen as a limiting factor in brood rearing and honey production during three drought years, 1954, 1955, and 1956. Transactions of the Kansas Academy of Science 61(3): 237-248.
vanEngelsdorp, D, J Hayes Jr, RM Underwood, D Caron, and JS Pettis (2011) A Survey of managed honey bee colony losses in the U.S., fall 2009 to winter 2010. Journal of Apicultural Research 50: 1-10.